Over the past five years, Aislinn Kate Photography has grown from a solo operation into a high-volume photography studio. They currently support four full-time and three-part employees (six photographers and a studio manager), and will have photographed nearly 300 sessions in 2017. Those course on how to build and manage an associate program will let you into the business, marketing, and logistics of her operations! 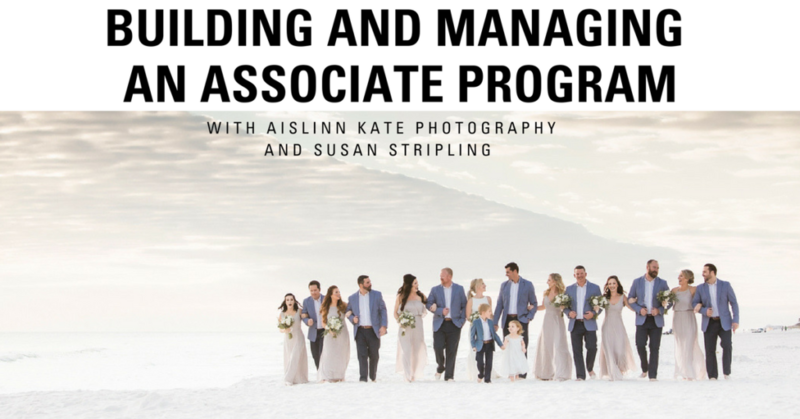 When Aislinn hired an associate photographer back in 2013,she started hearing the same questions from other photographers, again and again: What happens if they leave and steal your clients? How can you possibly book enough weddings to support another person? Why would someone want to hire an associate instead of hiring a business owner at a different company? How do you pay them? What if your associate photographer messes up? How can you still be creative? This class addresses all of these questions, and so many more! Laying the groundwork for a studio that can book and sustain multiple photographers. Maintaining brand consistency and individual creativity across multiple photographers. Paying employees, taxes, insurance, and workflow organization. Creating employee engagement and buy-in for a true, team culture. In this course about how to build and manage an associate program, Aislinn provides concrete, specific examples from her own studio (both the things that have worked, and the things that haven’t), as well as offer solid, actionable ideas for growing a studio in this way. At the conclusion of the class, viewers! will walk away with a full toolkit for starting and managing a successful associate program. How can you make sure the quality of the associate’s work is good enough, and consistent? How can you let an associate go out for you : don’t you worry about your reputation? How do you insure your associates? What’s the best way to let clients know that you are sending an associate shooter that is super awesome so the client feels comfortable? As the owner, do you take part in any of the client services, or should the associate so all contact with their hired clients? What is the job of the associate? Shoot only? Shoot and cull? Shoot cull and edit? Does the associate ever met or talk to the client before the wedding? How do you share his/her/their portfolio so that it doesn’t compete with yours or confuse prospective clients? Does your associate shoot their gear, or yours? Do your associates have the ability to use their images for their own marketing, or do they solely work for you with the images under YOUR copyright? Do you promise a particular associate in your contract with the client? Before you had full-time associates working in your studio, did they help with post-processing? Do you pay your associates a retainer to book a date and then the balance closer to the day? Do you create a contract with your associate for each wedding they shoot, or do you have an ongoing one? Do you send your associates out with second shooters? Assistants? Whose job is it to do the scheduling? How is your associate contracted with YOU? How does it work to send an associate to do a destination wedding? Are you responsible for their liability? Their travel insurance? Etc.? On the day of, does your associate shoot on your cards of their cards? If you are not at the wedding, how are the cards given to you? Or are the images put in an online access situation? Do you require a dress code for your associate shooters? Or merely make suggestions and let them use their own discretion even if it’s different than your own preferences (bright orange and florals versus black on black)? If your associate wants to follow up with a client to offer expertise in an area you may not offer, are they allowed to approach the client? When? Does the associate carry their own business cards? On the day of the wedding, how are queries from prospective wedding guests handled? Referred back to whom? Do you provide your associates with travel expenses for driving mileage, and parking expenses for local weddings? Does the associate see/review/understand the wedding contract that was presumably signed by the client? How do you handle associates pulling out/canceling midseason to go out on their own? Who owns the images made by the associate? Do associates get a commission on any upsales?